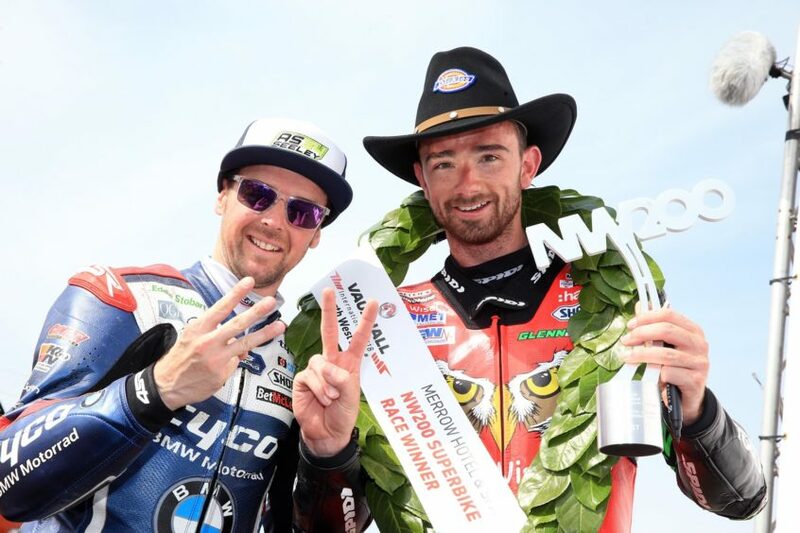 Glenn Irwin and Alastair Seeley dominated the 2018 Vauxhall International North West 200 as both riders claimed double victories. Irwin won both superbike races in perfect conditions with Seeley taking victory in the Supersport and Superstock events. The initial start of the final feature superbike event was red flagged after just one lap. Irwin seized control of the restart, blitzing the opposition from the drop of the flag to lead by 3.5 seconds after the opening circuit. “I regrouped and made sure I hit every apex.” the PBM/Be Wiser Ducati rider explained. The expected big bike clash between Irwin, Seeley and Michael Dunlop failed to materialise as BSB star Irwin dominated. Dunlop eventually trailed in almost ten seconds behind the Carrickfergus man on his Tyco BMW with Lee Johnston third on the Honda Racing Fireblade. Irwin had also led the earlier big bike seven lapper by six seconds before hitting trouble on the fourth lap. “Sometimes when you are not pushing to the limit you don’t make the gear shift as firmly as you should and I hit a false neutral coming into Juniper chicane.” he explained. After that scare Irwin’s lead was cut to less than a second but he recovered to take the chequered flag from Dean Harrison (Silicone Kawasaki) with Michael Rutter third on the Bathams BMW. Seeley failed to make the podium in either superbike race but he won the day’s opening Supersport event before going on to claim his 24th North West victory in a thrilling Superstock race. The 38 year old smashed the 600cc lap record on the EHA Yamaha R6 during the first race of the day, setting a new mark of 117.913mph on the final lap to take his second Supersport success of the week following his Thursday evening victory. “I was sizing everyone up during the first few laps and I changed my game plan from University on the last lap.” he explained. Seeley’s winning margin was 5.5 seconds from James Hillier (Quattro Plant Kawasaki) and Lee Johnston (Padgett’s Honda). Seeley turned the tables in the Superstock race on rival Peter Hickman (Smith’s BMW). The Englishman won Thursday evening’s stocker battle with a stunning late braking manoeuvre on Seeley at Juniper chicane. This time it was the Northern Irishman who outwitted his opponent, riding around the outside of Hickman on the approach to the same corner to take the lead on the final lap. “We were jockeying around trying different lines and I tried to keep them guessing where I was going.” the North West 200’s most successful rider smiled. Seeley’s hat-trick at the 2018 North West earned him the Man of the Meeting trophy which was presented by the late Robert Dunlop’s wife, Louise. Davey Todd was the Best Newcomer winner and Victor Lopez took the Best Overseas trophy. Juniper chicane was also the scene of a dramatic finale to the Supertwin event with James Cowton forcing his way past Joey Thompson on his McAdoo Kawasaki to take the win by 0.6 seconds. 20 year old Thompson looked certain to claim his first North West win on the Paton as he led Cowton and Jeremy McWilliams (KMR Kawasaki) along the coast road on the final lap. But a mistake by the youngster on the approach to Juniper was seized upon by Cowton and McWilliams also managed to squeeze through as the Paton rider floundered. “It was all down to that last chicane.” Cowton said. “Winning would have been the icing on the cake but two podiums will do.” McWilliams said but Thompson was distraught in defeat. “I had the whole race planned out in my head.” he said.